The County Administrator, Verna McDaniel, had passed out a memo outlining the plan to issue bonds to borrow up to $345 million to fund the County’s unfunded liabilities for employee pensions and healthcare benefits to the Commissioners the previous day. The “crisis” was manufactured by the County administration by following a recommendation of the retirement fund actuary to fully fund the liabilities within 10 years. 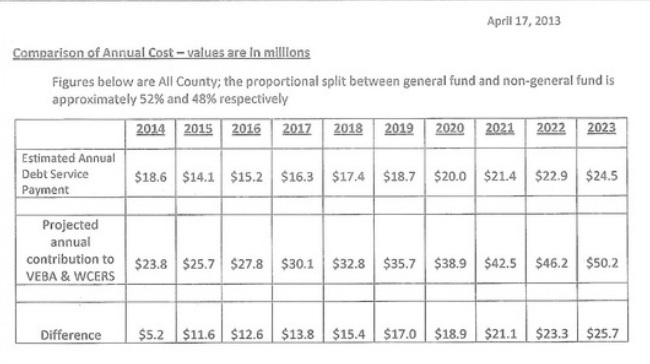 The following table was included in the Administrator’s memo to the Board, showing required contributions between $30 million and $50 million during the next 10 years. With numbers like this, it is no wonder that the Commissioners were scared. The first mention of the bonding issue at a public meeting was at the April 18 meeting of the Board of Commissioners. At a working session of the Board on May 2, the bond attorney John Axe presented the bonding plan to the Board. Meredith Shanle, President of Municipal Financial Consultants Inc., and daughter of John Axe, presents the financial benefits and risks of the bond proposal. Commissioner Dan Smith asks the consultants if the County isn’t doing the same thing as a homeowner who mortgages their house to put the money in the stock market. Commissioner Conan Smith talks about the risk tolerance of the Board with regard to the retirement bond proposal. Commissioner Conan Smith explains that the bond proposal could be put on the ballot as either an unlimited obligation or as a general obligation bond. An unlimited bond issue would allow any future board to levy a tax to repay the bond. A general obligation bond could only be funded by existing revenues. No one is suggesting an unlimited obligation bond question be put on the ballot. The Board Chairman, Yousef Rabhi, in consultation with the other commissioners decided to remove the retirement bond proposal off the agenda for this meeting. He cited the need for further public input and more financial information from the actuarial report. There was considerable discussion about the process of public hearings and the timetable for approval of the resolution. The plan was to put two public hearings on the agenda for June 5 & July 10, 2013 and the vote for approval of the bond proposal on the schedule for the July 10, 2013 meeting. Former Commissioner Wes Prater expresses concerns about the cost of interest on the new debt and tells the Board that they have an alternative to "Live within your means". The Board invites the public to provide input at a public hearing on the retirement bond issue. Former Commissioner Wes Prater thanks the Board and the administration for slowing down the approval process for the bond proposal. He expresses concerns about the use of the intermediate trust, which might do unexpected things with the money and that the proposal may not be allowed under the current legislation. Dr. Douglas Smith speaks in opposition to the bond proposal. Find the waste in the County budget and don’t borrow money to “balance” the budget. At the June 6 working session of the Board, an EMU professor was invited to give a presentation of a model to test the effect of various interest rates and stock market returns on the “profitability” of the bond proposal. Unfortunately, the Board had not fully explained how the bond issue or the intermediary trust would work, so the model gave an unrealistic sense of security to the Board. His model did not take into consideration that there would be about $5 million in cost to issue the bonds, that the investment costs would be about $1.4 million a year and that money would be taken out of the trust each year to make the contributions to the retirement accounts. Some of the Board members could be seen drooling (figuratively) at the prospect of making more than $100 million of profit in the stock market. His model did not take into consideration that there would be about $5 million in cost to issue the bonds, that the investment costs would be about $1.4 million a year and that money would be taken out of the trust each year to make the contributions to the retirement accounts. Some of the Board members could be seen drooling (figuratively) at the prospect of making more than $100 million of profit in the stock market. University Bank president, Steven Ranzini, talks about the measures of stock market valuation. He concludes that now is not a good time to invest the bond proceeds in the stock market, which is says is about 50% over valued. After the June 6, 2013 working session of the Board, it appeared that the supporters of the retirement bond proposal had the 5 votes they would need to approve the resolution. By the time of the July 10, 2013 meeting the support for the proposal was softening and questions were being asked about the readiness of the Michigan Treasury Dept. to approve such proposals. Organizing efforts for a petition drive continued at the Ann Arbor Arts Fair. By the time the Fair was over, more than 70 volunteers were ready to help with the petition drive. Other Washtenaw County political organizations had also promised to consider joining the petition drive. Commissioners Kent Martinez-Kratz and Yousef Rabhi had visited our booth at the Fair and we assured them of our confidence that we would collect the signatures required to get the proposal on the ballot. At the July 24 meeting of the Board the bond proposal was “off the table” indefinitely and the County Administrator made a presentation of the upcoming budget that assumes there will be no bonding for the retirement plans. Dr. Smith asked the Board for clarification as to whether or not the bond proposal was off the table. Conan Smith responded that it was. Although it appears that we have been successful in defeating the bond proposal, the law does not expired until the end of 2014, so we will need to remain prepared to collect signatures to put it on the ballot if the Board resurrects the proposal at a later date.